Not all films in the library collection are licensed with Public Performance Rights (PPR). For viewing at events such as programming done by student groups or faculty sponsored events open to the public where access is not restricted, films must be licensed for that purpose. Copyright law (USC 17§101) states that a performance is public if it is in a public space or if it is in any place if “a substantial number of persons outside of a normal circle of a family and its acquaintances” is gathered there. There is an exemption (USC 17§110) for “performance or display of a work by instructors or pupils in the course of face-to-face teaching activities of a nonprofit educational institution, in a classroom or similar place devoted to instruction”. Meaning films can be shown in a face-to-face classroom setting for instructional purposes if the access is restricted to those enrolled in the course. Some films in the library collection are already licensed with PPR and can be shown to a non-paying audience. To confirm whether a film comes with PPR, check the title notes field in the catalog record. 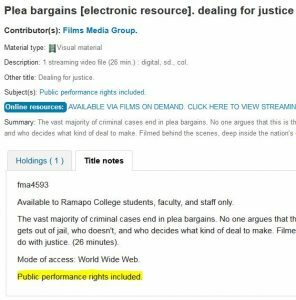 If you are a member of a student group looking into securing PPR for a film and the library copy does not have the license, please contact the Center for Student Involvement (csi@ramapo.edu). They will assist you in finding the licensing and pricing information for a film screening.